Short Attack, the monthly selection of fine shorts by our friends at interfilm, will be screened Wednesday, 12th September 2012 at Babylon Berlin. As always, you can expect a delicate selection including favs from Directors Lounge like Max Hattler´s iconic collision and David Downes poetic Generation. 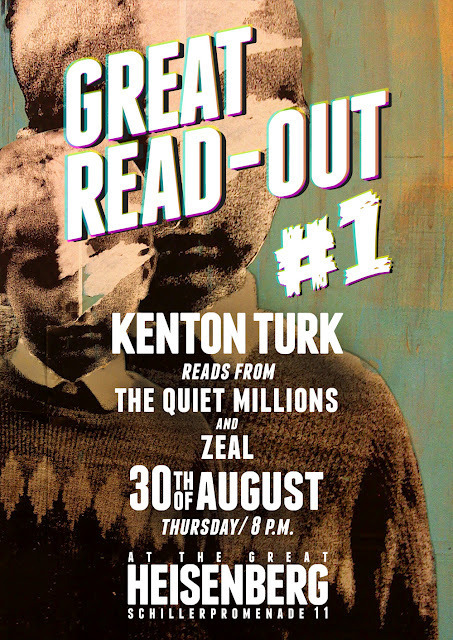 The Great Heisenberg begins its series of “Great Read-Outs” with Kenton Turk, whose stories prove at turns tantalizing, tortured, touching and twisted. Here, seemingly average folks reveal extraordinary features, brains are turned inside out to reveal the inner workings, and some get what they deserve while others don’t. Or maybe do, depending on your take on things. A Greek holiday ends in a hopeless and bizarre quest, a Siberian babushka is revealed to have a sinister core, a lacklustre guesthouse maid between the Wars turns out to be a touch too curious, a man cannot curb a voracious appetite that goes beyond food, what seems to be a baby is the subject of furtive gossipy speculation, and more. These stories will take you out there – but possibly not bring you back. A cool thing to do. Sit back, sip a cognac or a coffee, a brandy or a beer, and let yourself get seduced into left field. The Great Heisenberg, Schillerpromenade 11, Neukölln (U-Boddinstr. or U-Leinestr., also Bus 104 +167, stop: Herrfuhrtstr.). Thursday, August 30 at 8:00 pm, in English. “Enthralling, original and deeply moving.” – Michael Roes, author of Rub’ al-Khali – Leeres Viertel, Die fünf Farben Schwarz, Die Laute, and other works. The Great Heisenberg beginnt seine Reihe der “Great Read-Outs” mit Kenton Turk, dessen Geschichten sich im Wechsel als verlockend, verabscheuend, verwunderlich und verdreht erweisen. Hier offenbaren scheinbar durchschnittliche Menschen außergewöhnliche Eigenschaften, Gehirne werden umgedreht, um das Innenleben zu zeigen, und einige bekommen was sie verdienen, während andere nicht. Oder doch, abhängig davon, wie man die Dinge sieht. Ein Urlaub in Griechenland endet in einer hoffnungslosen und bizarren Suche; eine sibirische Babuschka enthüllt einen finsteren Kern; ein glanzloses Gästehaus-Dienstmädchen zwischen den Weltkriegen zeigt sich etwa zu neugierig; ein Mann kann einen unersättlichen Appetit, der übers Essen hinausgeht nicht bändigen; was ein Baby zu sein scheint ist das Thema heimlicher, geschwätziger Spekulation, und mehr. Diese Geschichten werden dich dahin bringen – aber möglicherweise nicht zurück. Eine ziemlich coole Sache. Lehne dich zurück, genieße einen Cognac oder einen Kaffee, einen Brandy oder ein Bier und lass dich in den heiteren Himmel verführen. The Great Heisenberg, Schillerpromenade 11, Neukölln (U-Boddinstr. oder U-Leinestr. sowie Bus 104 + 167, Haltestelle: Herrfuhrtstr.). Donnerstag, den 30. August um 20:00, in englischer Sprache. „Spannend, originell und zutiefst anrührend.“ – Michael Roes, Author von Rub’ al-Khali – Leeres Viertel, Die fünf Farben Schwarz, Die Laute, u.a. 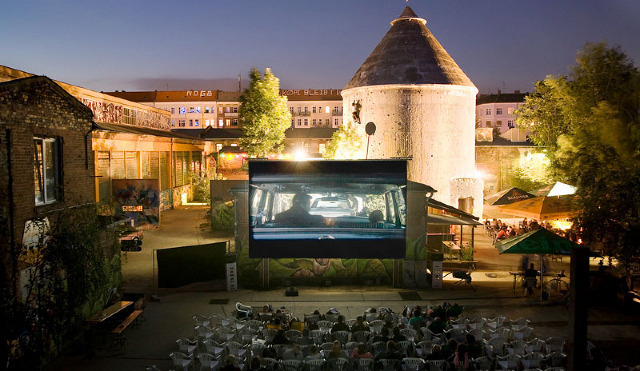 On Saturday 14th July, the Berlin Film Society will host the world’s biggest pop-up film festival in one of Berlin’s best open-air cinemas, Freiluftkino Insel im Cassiopeia. The Summer Season of the Future Shorts Film Festival is an exciting mix of new, award-winning short films from around the world. The program includes gems like Tampere Film Festival winner WE’LL BECOME OIL by Mihai Grecu, one of the audience darlings of this years 8th Berlin International Directors Lounge. We participated in this year´s 日本デ , the 10th Japan-Day in Duesseldorf, celebrating the 150 anniversary of Japanese-German diplomatic relations. 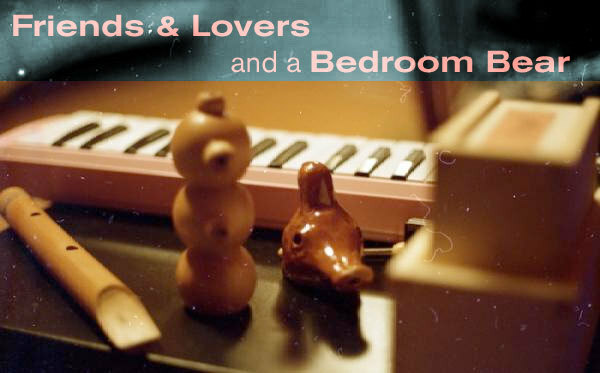 Two female filmmakers present their work at Z-Bar, the upcoming Directors Lounge screening. Both show a clear female point-of-view onto their subject without calling themselves feminists. Maru Ituarte, born in Monterrey, Mexico, has recorded and collected images of her surrounding with a critical view onto the violent, destructive and male-oriented aspects of a society that separates the male and female spheres at large. A found box of Hi-8 tapes, meant to be recorded over, became the source for a work called „Mexican Goulash“, which has a stunning similarity to a compilations of those self-obsessed clips to be found on Youtube in our days. It becomes the portrait of a certain part of the middle class. 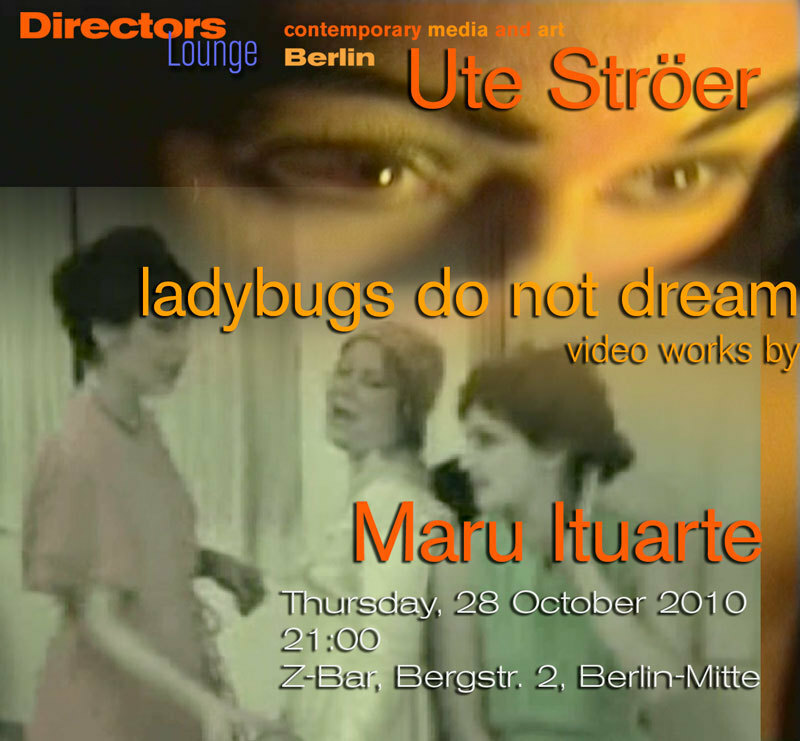 Ute Ströer’s interest in film is based on her love for fairy tales and horror movies. The filmmaker meticulously works on the look of her images, strives for perfection in color and composition, and with her film characters she tries to achieve the largest band-with of expression and possible interpretation. The narrator we might have believed to hear exists only in the viewer’s head, the story we read only exists in fragments of symbols, a “Glasperlenspiel” of meanings. Thus, as much as the aesthetic of the two artists may differ, they have much in common. Both invite, even seduce the viewer to follow onto a subjective journey of female perspective, when half-way on seemingly secure roads the viewer realizes, it’s their own imagination that has been triggered, their own story they have lived through, and actually, there is no such simple interpretation. The artists will be present and available for Q&A. 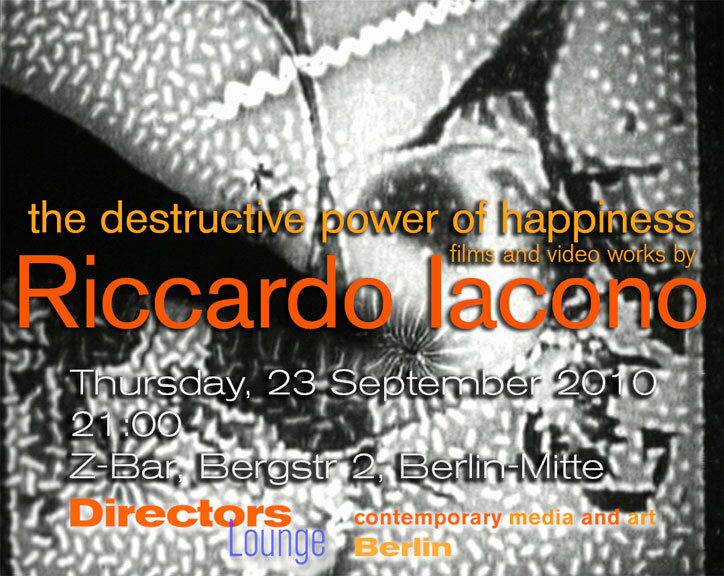 Riccardo Iacono, London-based artist and filmmaker, presents a selection of films and video from three different bodies of work: abstract videos, hand-painted films and performance tapes (produced between 1993-2007). “I like the destructive power of fire”, a friend stated to Riccardo. 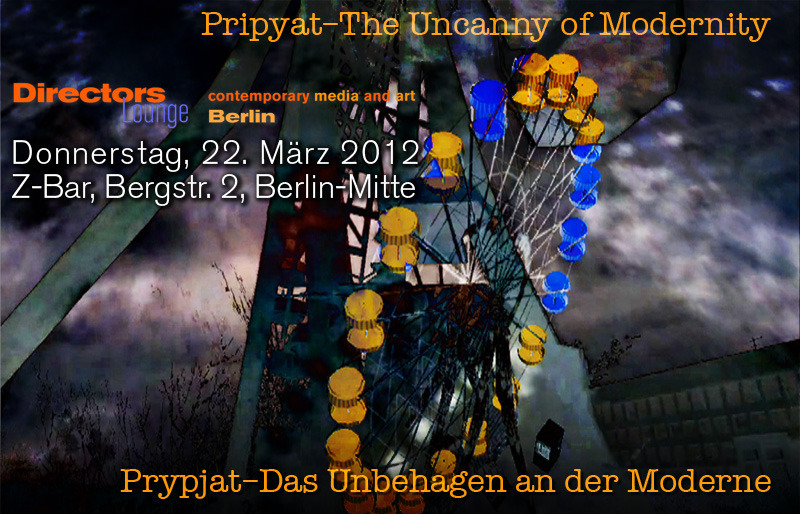 It became the source for the title of the show in Berlin. Riccardo’s fire might be his anarchistic disposition to destroy static concepts. 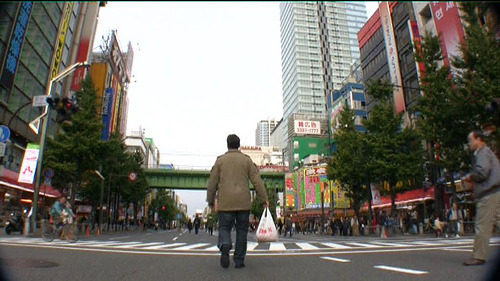 However, he does not avoid the pains, the exhaustive efforts it takes to make art from “happiness”. Jari Haanperän lives in Berlin and together with Mirka Flander, his producer, he is running the gallery Suomesta. With his installations, Jari Haanperän takes up and further develops the idea of the Light Space Modulator by Laszlo Moholy-Nagy. 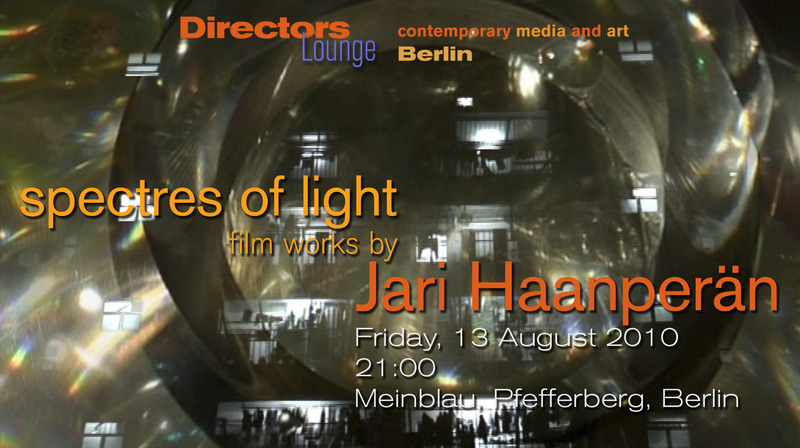 Although Jari’s film works on the other hand appear very different to the abstract spirituality of Moholy-Nagy’s light machine, the two constituting elements seem to be the constant source of inspiration for artist and filmmaker Haanperän: light and the spirited machine. However with Jari, these elements seem to evoke their opponents: darkness, which is needed for the effects of light, or lumen, and the darker forces. Maybe, in order to deal with darkness and those darker forces, we also need storytelling, dark humour and irony. At least, this is what Jari Haaperän is doing in his film works: he tells short stories. In several of Jari’s films, the story goes back to the mechanical age: “The Turkish Chess Machine” refers to the famous “Schachtürke”, a mechanical Robot made in Austria in 1769. In “Kalavalo”, on the other hand, the artist gives a surrealist vision of the first deep-sea exploration undertaken in a spherical steel box by biologist Charles William Beebe in 1930. This saying, don’t we see the mechanical age as the succeeding period of enlightenment? 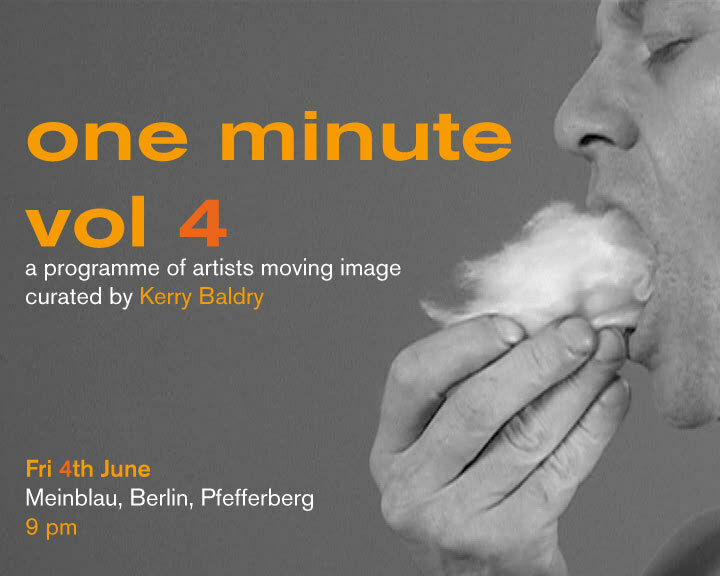 This touring programme is the forth in the series, an eclectic range of moving image with formats such as 16mm film, Super 8, video, stopframe animation, superimposition, all constrained by a time limit of one minute. Katharine Meynell, Jonathan Moss, Eva Rudlinger, Chris Meigh Andrews, Martin Pickles, Gordon Dawson, Sam Renseiw and Philip Sanderson, Tony Hill, Laure Prouvost, Stuart Moore and Kayla Parker, Kerry Baldry, Alex Pearl, Steven Ball, Anahita Razmi, Kate Jessop, Bob Levene, Erica Scourti, Elizabeth Hobbs, Liam Wells, Claire Morales, Michael Cousin, Tina Keane,Virginia Hilyard, Riccardo Iacono, Fil Ieropoulos, Marty St. James , James Snazell, Stuart Pound, Richard Tuohy, Simon Payne, Tansy Spinks, Louisa Minkin, Zhel Vukicevic, Leister/Harris, Nicki Rolls, Nick Herbert, Daniela Butsch, Michael Szpakowski, David Kefford, Cate Elwes.